Vehicle rollover accidents are especially likely to result in catastrophic injury or death. They can happen to anyone, at any time, and in any kind of car — though larger vehicles with a higher center of gravity carry greater risk. Unfortunately, the victims often include innocent drivers and passengers in nearby vehicles. These people and their families are entitled to financial compensation for their injuries, as well as for wrongful death. At Van Sant Law,, we understand how devastating vehicle rollover accidents can be for everyone involved. That’s why we want to help make drivers aware of the dangers. Cautious, careful driving can help you minimize your risk for rollover. And when accidents do happen, professional legal representation can ease the weight on your shoulders. If you or a loved one has been injured or killed in any kind of vehicle accident in Georgia, the road ahead can be a long one. But you never have to travel it alone. Remember that Georgia personal injury law is designed to help you pay for your medical expenses and move on with your life. Our firm offers experienced, compassionate assistance for rollover victims and their families. When you need legal representation or advice, an Alpharetta auto accident attorney at Van Sant Law, can help. Arrange for your vehicle to be safely stored (this allows us to preserve the vehicle’s value as evidence). Investigate the scene of the accident with the help of relevant experts. Hire qualified experts to inspect your vehicle and determine exactly how the crash happened. Communicate with the attorneys and insurance representatives involved in order to effectively advocate for your interests and rights. Some rollovers are freak occurrences for which no fault can be assigned, but more often, negligence is to blame. Some cars flip because of a defect in the vehicle itself or because of negligent maintenance work or repairs. Some may “trip” on hazards that commercial truckers or work crews left in the roadway. In other cases, a driver’s careless operation of his or her own car can cause a rollover that injures others. 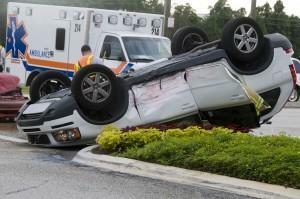 If you’ve been involved in a rollover car crash, an Alpharetta auto accident attorney at Van Sant Law, can help. State law entitles you to compensation for your medical expenses, physical pain, emotional distress, time away from work, and other relevant damages. In the event of wrongful death, close family members may also be able to recover for their losses. Remember, time limits apply to most Georgia personal injury cases, so you should take action as soon as possible. Contact our office to schedule a free consultation right away or fill out the contact form and we will get back with you. Van Sant Law, is proud to serve residents throughout Alpharetta, Atlanta, Fulton County, and the entire state of Georgia.